The Atlantic Salmon Federation (ASF) is a world-leading science and advocacy organization dedicated to conserving and restoring wild Atlantic salmon. Headquartered in New Brunswick, Canada, ASF oversees a network of seven state and provincial councils, and 103 affiliated groups. Altogether we represent more than 25,000 members and volunteers. 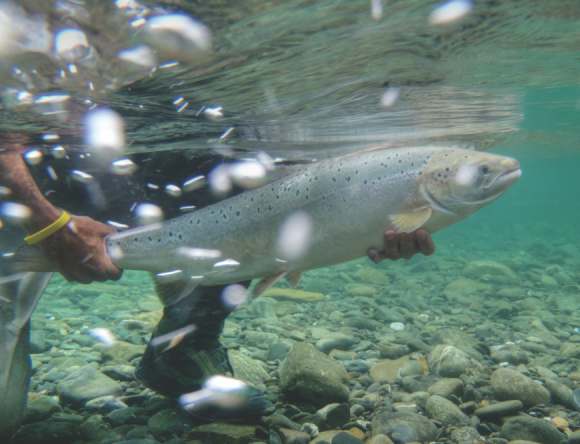 ASF conducts research on wild salmon throughout the North Atlantic, performs complex river restoration projects and advocates for good environmental decisions. Internationally, ASF negotiates conservation agreements with commercial fishermen in places like Greenland and the Faroe Islands. The Atlantic Salmon Association, a predecessor of ASF, is formed in Montreal. Noted architect Percy Erskine Nobbs was a driving force in the creation process. Hot off the press – the first issue of our flagship magazine Atlantic Salmon Journal is published. ASA members raise concern about widespread DDT spraying, an early voice in the movement to ban the practice. The International Atlantic Salmon Foundation, a predecessor of ASF, is established in St. Andrews, N.B. Quotas are established for the offshore salmon fishery at Greenland, and offshore fisheries in New Brunswick and Newfoundland and Labrador are closed. Momentum builds to stop near-shore commercial net fisheries in Canada. IASF opens an international centre for salmon research near St. Andrews, N.B. From left, John Anderson, University of New Brunswick President, Wilfred Carter, Executive Director of IASF, Hon. Romeo LeBlanc, Canada’s Minister of Fisheries, William J. Porter, U.S. Ambassador to Canada, and Richard Hatfield, Premier of New Brunswick, were on hand. ASA and IASF combine to form the Atlantic Salmon Federation (ASF), a pre-eminent conservation organization on behalf of wild Atlantic salmon and their environment. ASF advocacy leads to the formation of the North Atlantic Salmon Conservation Organization (NASCO), an international treaty group focused on reducing mixed stock salmon catches at Greenland and the Faroe Islands. The Matapedia Accord is signed by ASF and representatives of its six regional councils, setting the stage for coordinated conservation efforts that persist today. The first Atlantic Salmon Interpretive Centre in North America is opened in St. Andrews, N.B. Visitors from around the world learn about wild Atlantic salmon conservation. Passage of the U.S. Clean Air Act sees coal plants curtail sulphur dioxide emissions, ending the scourge of acid rain which caused extensive damage to salmon habitat in Nova Scotia. Nathaniel Reed, a long-time director of ASF, was instrumental in the development and passage of the law. ASF and Fisheries and Oceans Canada deploy acoustic tags on wild Atlantic salmon in the Bay of Fundy, one of the earliest attempts to monitor fish movement with sonic technology. ASF and the North Atlantic Salmon Fund sign the first agreement with Greenland commercial fishermen to suspend their harvest of wild Atlantic salmon. A continuation agreement is signed in 1994. ASF plays a key role in removal of the Edwards Dam on the Kennebec River in Maine, the first major dam demolition in Eastern North America to benefit wild Atlantic salmon and 10 other species of sea-run fish. The Canadian federal government completes the buy-out of the commercial Atlantic salmon fishery in its territorial waters. ASF and the North Atlantic Salmon Fund reach a new agreement with Greenland commercial fishermen to suspend their wild Atlantic salmon fishery. The deal lasts until 2010 and contributes to increased North American salmon runs. A final agreement is reached between ASF and its partners to restore the Penobscot River in Maine, officially launching the Penobscot River Restoration Project to restore the Penobscot River in Maine is reached. A pilot project is launched by the Nova Scotia Salmon Association and ASF on the West River (Sheet Harbour) to add lime directly to the watercourse and reverse the damage caused by acid rain. The project is ongoing and hailed as a restoration success. ASF researchers celebrate a milestone after the first detection of a tagged juvenile Atlantic salmon at the Strait of Belle Isle, more than 1,000 kilometers from the tagging site and half the distance to Greenland. The Government of Canada makes a $30 million endowment to create the Atlantic Salmon Conservation Foundation. ASF President Bill Taylor, DFO Minister Loyola Hearn, and Bud Bird, Canada’s Commissioner to NASCO were instrumental in the fund’s creation. ASF begins a long-term partnership with the Conservation Fund’s Freshwater Institute for research and development of land-based, closed-containment salmon aquaculture. ASF releases a study on the economic value of wild Atlantic salmon which found the species generates $255 million in Eastern Canada each year. Click here for 3-page summary. The removal of the Veazie dam on the Penobscot River is completed. Combined with the earlier removal of the Great Works dam, more than 1,600 kilometres (1,000 miles) of river and stream habitat is reopened to 11 species of sea-run fish. 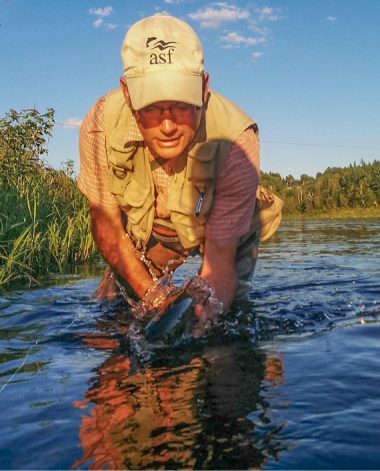 ASF president Bill Taylor is invited to serve as vice-chair for Canada’s Ministerial Advisory Committee on Atlantic Salmon, struck in response to record low salmon returns on some rivers in 2014. ASF and partners complete a man-made channel around the Howland dam, the final major work of the Penobscot River Restoration Project. ASF joins DFO and others in the creation of the Atlantic Salmon Research Joint Venture, a coordinating and funding body for future Atlantic salmon research in Canada. ASF challenges the Newfoundland and Labrador government in court over the Placentia Bay aquaculture project and wins. ASF researchers publish the world’s first scientific paper detailing movement of adult Atlantic salmon in the Gulf of St. Lawrence and Labrador Sea, revealing behaviour like deep dives over 900 metres. ASF and the North Atlantic Salmon Fund sign a landmark 12-year agreement with Greenland fishermen to suspend the commercial harvest of Atlantic salmon and limit the fishery to a 20 tonne subsistence quota, a deal that will save thousands of adult salmon annually.